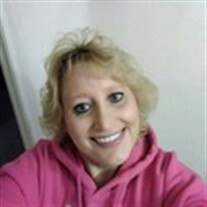 Obituary for Michelle Renae Boven | Langeland Family Funeral Homes, Inc.
Michelle Renae Boven of Portage, age 48, passed away February 19, 2018. Michelle was born October 23, 1969 in Vicksburg, MI, the daughter of James and Aletha (Veldt) Boven. She was preceded in death by her mother Aletha Boven in 2016. Surviving are her daughters Brieanne (Bobby) Maya and Devone (Travis) Dinse; her granddaughter Anyah Dinse; and her father James Boven as well as many other special family and friends. Michelle was a loving mother, daughter, and grandmother. She was caring and compassionate toward everyone she encountered. The family would like to welcome extended family and friends for a Memorial Gathering at the Langeland Family Funeral Homes, Portage Chapel, 411 E. Centre Ave. from 11:00am until 1:00pm on Saturday, February 24th, concluding with a brief prayer service. Memorials in Michelle's memory may be directed to Pine Rest Christian Mental Health Services.